K series RN 998-0661-16 Copeland Copelametic refrigeration compressor valve plate assembly. This valve plate fits all K models except KAE - KAR. Fits KATA-0150-CAV-800, KATB-016E-CAV-800, KATA-015E-TAC-800, KATA-0150-CAB-800, KALB-015E-CAV, KALA-015E-TAC-800, KALA-0150-CAB-800, KAJA-010E-CAV-800, KAJB-010E-TAC-800, KAMA-007E-IAA-800, KAMB-007E-CAA-800, KAKA-0100-CAB-800. 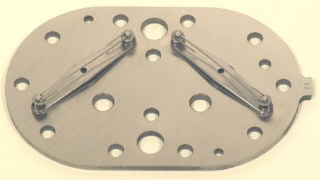 Replaces all previous variants of the K series valve plate.